If you have been unmoved with Samsung's recent Galaxy Tab 3 line introduction, like the 10-incher you see in the thumb, it's not hard to fathom why, but its modest specs sheet might mean that Samsung is saving the best for last. We've heard about an upcoming 11" slate from it before, but now he rumor is getting fleshed out in a 12.2" reincarnation. A Korean publication that often leaks on Samsung- or LG-related topics, is claiming that we will see the largest member of the Galaxy Note family pretty soon, meaning that an S Pen stylus will be a staple. The screen is actually said to be 12.2", to be exact, and sport the ultra high resolution of the Nexus 10 tablet, at 2560x1600 pixels, working it out to about 247ppi pixel density, which is not bad for a large tablet by any means. The Note 12.2 (working title) will have a panel supplied by Sharp in some batches, says the source, as its IGZO display tech means thin and bright packages with very low battery consumption. The 12-incher is expected to be announced in Q3, and the other interesting thing is that the source claims it is meant to beat a larger iPad to market, which would mean another tablet headscratch, to say the least, and perhaps Apple's answer to the glut of Haswell- and Bay Trail-based Wintel convertibles that is hitting this holiday season with battery lives comparable to current ARM-based tablets. "Shouldn't be it the other way round ? xD" Shouldn't it be the other way round ? :P and lol yeah you are right! To get that sort of PPI on a 12 inch tablet, you'd have be approaching screen specs of 4K. This tablet has the same amount of pixels as the Nexus 10 but because of the larger screen size, the pixels are spread further apart. Todate, the nexus 10 has the highest PPI of any tablet. If you was to make the nexus 10 screen smaller, say 7 inches, then the PPI would be closer to 440. However making it larger will decrease the PPI as demonstrated by this tablet's specs. This is what I'm waiting for...:) come on samsung!! bring it on!! Physical buttons increases your screen size...a 12 inch screen will give you true 12 inches as opposed to a 12 incher with virtual buttons...what's there to hate about it? Virtual button wouldn't use even 10% of the screen, and screen will still bigger than the 10.1 inch tablets. And the buttons positions of the Tab 10.1 is pretty awkward and uncomfortable to use in portrait mode. The old buttons and notifications layout of the Honeycomb/ICS where much comfortable and convenient for the 10+ inch tablets than middle position keys and the notification bar on the top of JB for me. Physical button is actually much better on a tab as using the semi permanent ones onscreen means a bar bar of screen space is wasted for nearly everything but video playback. Samsung does remove the bar for video playback already but not having it at all would be great. Yo SAMSUNG ...to be able to compete against the full-sized iPads, you need to beat them to the price (as what captain obvious has been insisting since day one) but so far you aren't very good at pricing your devices competitively...Note 8, Mega 6.3....anyone? Who in their right mind would buy these??? Samsung can be alot of things good or bad, but samsung not selling is not one of them. I'll choose an Android phone over an iPhone any day of the week. But Android tablet ecosystem is vastly inferior and no amount of nice hardware on the OEMs' part will make up for the lack of tablet-optimized/tablet-specific applications. Until then, the iPad is the go-to tablet. Hopefully this changes in a couple of years. Great Job Samsung ! I was waiting for that size ! 12" always made sense. You can hold a 7-8"-er in one hand or two but for larger two hands are mandatory anyway, so providing they can cut down bezels and weight, 12" makes sense. Really, the Note 8.0 should be in the $300 category and the Note 12.0 with 2600k screen in the $500, I'd consider buying either. Where's thump down button ? 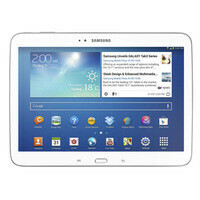 Galaxy tab 7.0'' 7.7'' 8.0'' 12.1'' Galaxy note I II 12'' Galaxy S4, S4 mini, S4 zoom, S4 active.. Stop milking consumer's money. the best part, they shrinks/ enlarge and mix and match internal components. If the next big things are already here as illustrated by their ads, samsung should really shut the f up right now. Are you happy to see 1 month after buying your phone, your phone get bumped down by another phone of similar, slightly improved spec? as in the case of buying a S3 mini, just to get it overtook by samsung galaxy grand? I though Samsung was suppose to be releasing a tablet with a high resolution super amoled display this year?